Hello there and welcome to the last day of Clearly Besotted Teasers for November. Have you been enjoying them? For my card today I am using the beautiful Winter Blooms set. 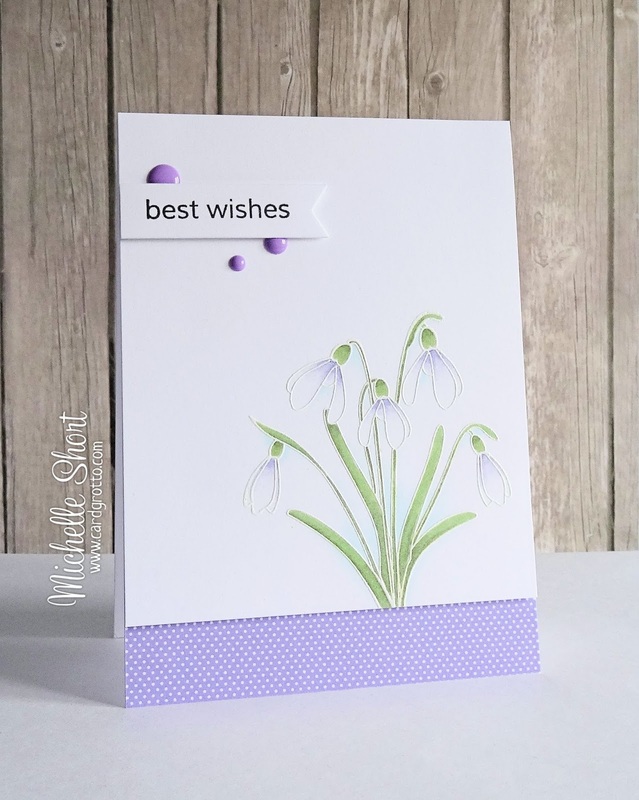 I have first taken the stunning Snowdrops and stamped them in Versamark and heat set with white embossing powder. These have then been coloured using Copic Markers, adding a little clear WOS to the flower buds. I have then added this panel to a white card base, which has a strip of Doodlebug paper along the bottom, with foam tape. The sentiment, from the A Little Sentimental set, has been stamped and cut out using the banner die from the Tag Along die set. This has also been added to the card with foam tape and I have added a few Doodlebug Sprinkles to finish. COPIC MARKERS: G82, G85, BV31, BV34, B000, 0. There is one set that I haven't teased you with yet, unfortunately I ran out of time. I will be sharing that with you soon. As always, please pop over to Stephanie's blog to see the release in full. Unfortunately, due to me still not feeling well I won't have a release video up for you this month, I am so sorry :( The new products will be available to purchase this evening from 10pm GMT. You can purchase them from the Clearly Besotted Shop, Simon Says Stamp and Ellen Hutson. Thanks you so much for visiting me today. Very pretty Michelle. I love the colours and the great CAS design really lets this gorgeous image shine. Michelle, this is simply gorgeous! Love it! I love this stamp is so delicate and beautiful! Your shading and colouring are simply perfect. Stunning and elegant card. I'll miss your release video but please get well soon. Amazing,Michelle! 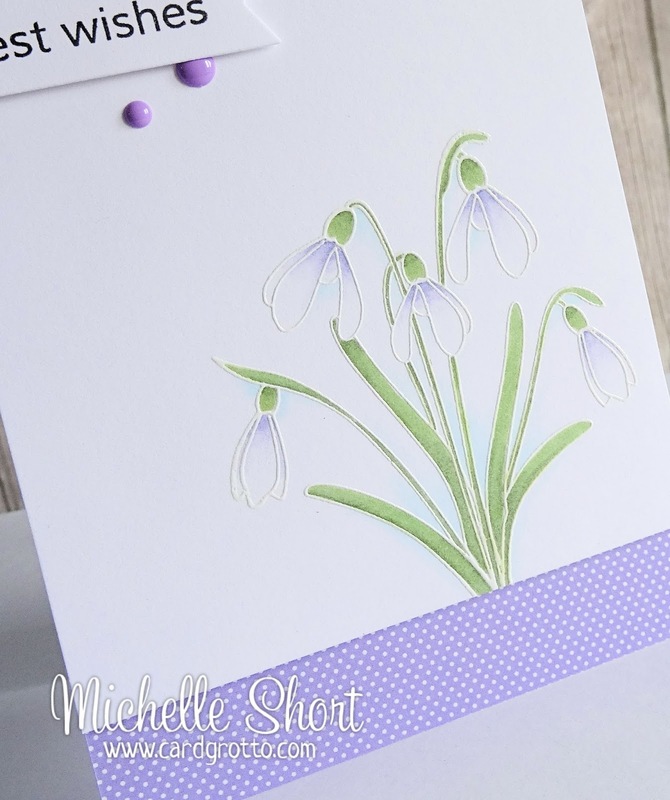 Pretty coloring on the snowdrops,and i love the purple dots and paper!! Just lovely. You have such a great talent Michelle... I love the way you use the white space with such confidence. Your style is so fantastic and consistently wonderful. Love the delicate colouring of the flowers. WOW! This is stunning. Definitely my favourite from the new release and your delicate design is perfect. First, sending positive vibes your way in hopes they'll nudge you to feeling better soon. Second, once again, you showcase the winning combination when your creativity marries with CB products. Your card is gorgeous. Very beautiful! Love these flowers! the touch of purple is sooooo stylish on this card. Amazing! Another stunner, Michelle! Hope you're feeling better very soon. Stunning card! This lovely stamp set is definitely growing on me! Gorgeous card...love the flowers & purple polka dot paper!! A simple and beautiful card!! Thanks so much for creating this gem! Hi Michelle, just wanted to say hello!!! You haven't been around for a while and it just crossed my mind this morning so I thought I'd stop by to say hi and say I hope you're okay! !